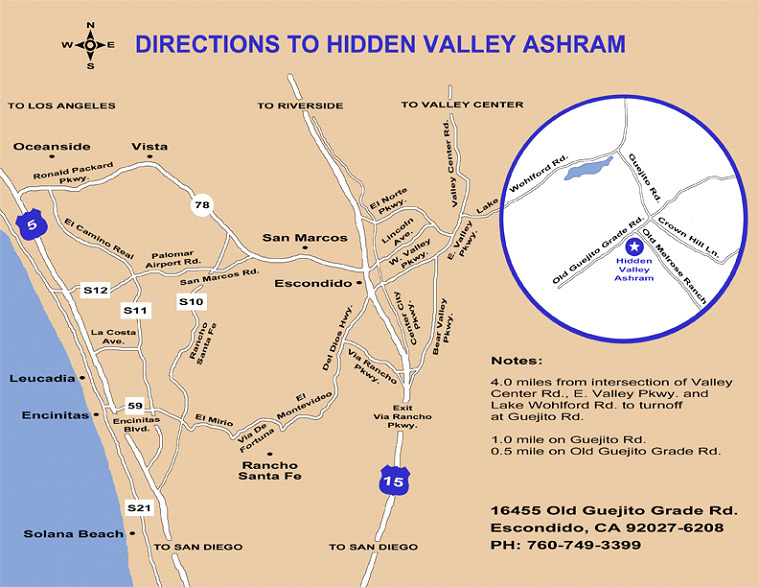 Please see the following directions to Hidden Valley Ashram. Go south on Interstate 5 to Oceanside. Exit onto California 78 and go east to Escondido. Take the north Interstate 15 exit, then exit onto El Norte Parkway. Go east (or right) for about five miles. Turn left on Valley Parkway, ad go 1.1 miles. Turn right on Lake Wohlford Road and continue past the lake (4.5 miles. Turn right on Guejito Road and go 1.1 miles. Turn right on Old Guejito Grade Road, which leads directly to our property (1 mile). Go east to Escondido. Take the north Interstate 15 exit, then exit onto El Norte Parkway. Go east (or right) for about five miles. Turn left on Valley Parkway, and go 1.1 miles. Turn right on Lake Wohlford Road and continue past the lake (4.5 miles. Turn right on Guejito Road and go 1.1 miles. Turn right on Old Guejito Grade Road, which leads directly to our property (1 mile). Exit onto El Note Parkway. Go east (or left) for about five miles. Turn left on Valley Parkway, and go 1.1 miles. Turn right on Lake Wohlford Road and continue past the lake (4.5 miles. Turn right on Guejito Road and go 1.1 miles. Turn right on Old Guejito Grade Road, which leads directly to our property (1 mile). Exit onto Via Rancho Parkway. Turn right onto Via Rancho, and continue for about 6 miles (the road changes name to Bear Valley Parkway). Turn right on Valley Parkway, and go 1.1 miles. Turn right on Lake Wohlford Road and continue past the lake (4.5 miles. Turn right on Guejito Road and go 1.1 miles. Turn right on Old Guejito Grade Road, which leads directly to our property (1 mile). Please Note: the directions from a GPS may misguide you, and cell phone service is not reliable in this area. We recommend you refer to the instructions beside when determining your route.